Our MB-2000 mini excavator is a compact multifunctional machine. It’s small, powerful and versatile. At a compact width of 825 mm you can even use this micro excavator in difficult to access areas. It has a powerful 6,5 PS YANMAR diesel powered engine to power the high performance hydraulic system. The electric start makes it easy to start. This is a complete set! Delivery includes the 30 cm, 40 cm and 60 cm buckets, plus a ripper for breaking up soil and a grapple for lifting e.g. rocks or logs. The extremely practical quick-change system allows you to quickly change attachments. A recurring question: Can the bucket also be reversed so the opening is at the front? Yes you can. Simply turn the quick-change adapter and you can fit the buckets the other way around! The gear and pivot joint allow a 360° swivel radius. 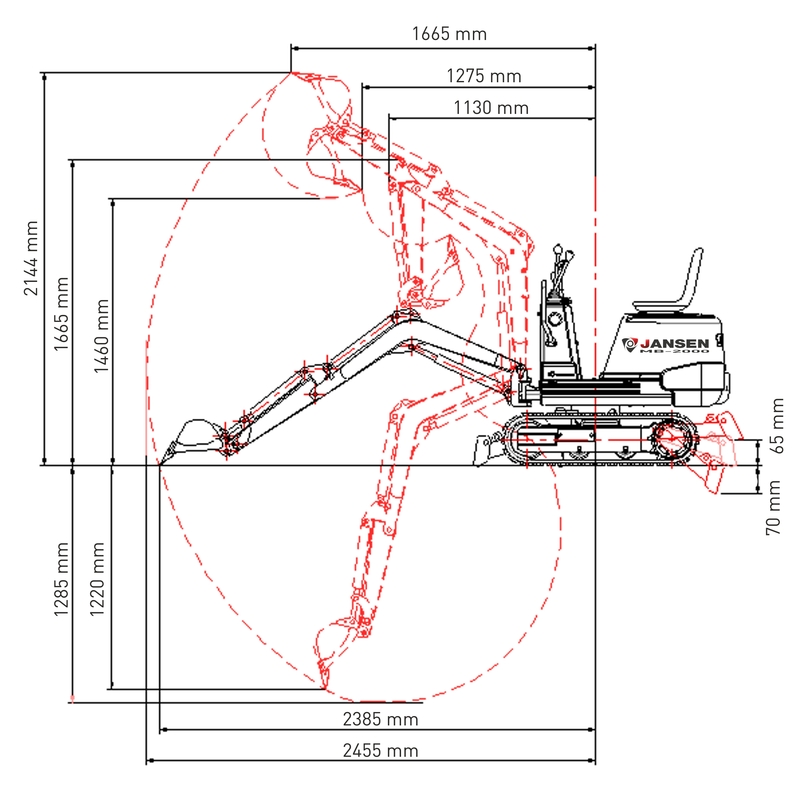 Our MB-2000 further features an additional control unit on the excavator arm. This expands your work area to e.g. operate an auger on this excavator. The dredging depth of 128 cm and ejection height of 166 cm make this machine your perfect tool for professional use at home or for your business. The low surface pressure and versatility ensure minimal damage to the soil, which is particularly important when working in gardens. A folding roll-over bar with built-in canopy, the robust hydraulic dozer blade, and intuitive, simple operation complement the performance of this mini excavator ideally. The MB-2000 mini excavator comes with four-way control lever steering. As shown in the pictures, it has 2 joystick levers for operating the excavator arm and the scoop, and 1 control arm for the chain drive and 1 for the dozer blade. You can assign the functions yourself based on how the hydraulic lines are connected. This unit is delivered on a steel pallet. You should allow approx. ½ hour for final assembly. Please contact us for further assistance. You will further need approx. 1 litre of motor oil for the engine. We recommend 10W40 or 15W40 multi-grade oil.